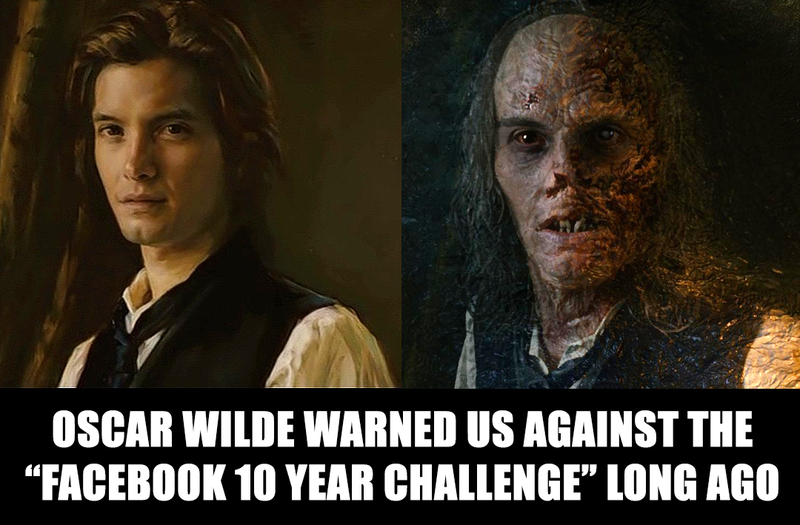 In the era of social media, it's not difficult to see a parallel between Oscar Wilde's Gothic novel The Picture of Dorian Gray and the ongoing Facebook trend called the "10 Year Challenge." The digital zeitgeist of posting selfies, replete with filters and photo editing, often creates the pressure to project an ageless, flawless online identity. This certainly brings to mind Dorian's eternally youthful outward projection - contrasting the haggard, rotting inner self which he conceals from the world. As we post images of ourselves online, it's worth thinking about who we pretend to be... and who we actually are behind the screen.